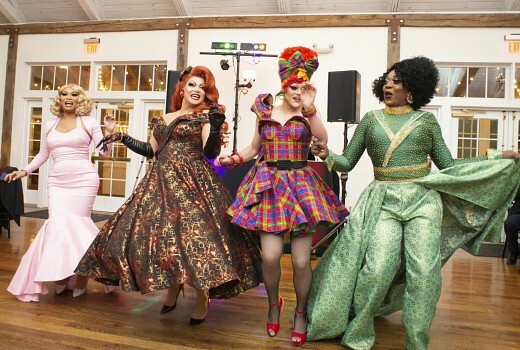 TLC will premiere reality special Drag Me Down the Aisle which sees four American drag queens help a struggling bride salvage her wedding day. Wedding planners extraordinaire by day, drag queens by night! Meet the fun and fabulous team on a mission to help a bride discover her inner queen and slay her big day as TLC turns fantasy into reality in Drag Me Down the Aisle. RuPaul’s Drag Race alumni BeBe Zahara Benet, Jujubee, Alexis Michelle and Thorgy Thor have decades of experience in the wedding and beauty industries and are joining forces to help bride-to-be Emily on her journey to marrying fiancé John. Every bride wants to feel special on her big day and Emily is no different. Recently engaged, she is head-over-heels in love and excited to get married; but deeply rooted body image issues have her second guessing her “dream” dress, and an extremely tight budget has not allowed her the fairytale wedding she had hoped for. Emily, an Amish Country bride who is typically most comfortable in flannel, jeans and no make-up, desperately wants to step it up for her wedding day and knows she needs some serious help! Determined to turn things around, and despite feeling nervous over her uber-conservative parents’ reaction, Emily enlists BeBe Zahara Benet, Thorgy Thor, Jujubee and Alexis Michelle as her own personal team of drag queen wedding experts who will have just three short weeks to save the day. Jumping in quickly, the queens whisk her away on a wedding adventure full of surprises, helping Emily to step into a new look and newfound confidence as they get to work transforming her ordinary wedding reception into the fantasy affair she never saw coming. From the dress to the venue to the inner glow a bride always strives for, this dream team of experts will use every trick in their bag to make sure Emily slays her special day! With the help of her new friends, she’ll brush off her boring and find herself strutting down the aisle like the queen she always had hiding inside. Drag Me Down the Aisle will have you saying yasss to the dress and cheering for a happily ever after.